With reference to the article on the splendid Matchless in the October edition of TCM, it may well have been entitled ‘Sizing up’ as indeed it was; were owner Andy Pennell and tester Phil Turner aware they were riding a 350? Andy has a G5 Matador engine squeezed into his G2 frame; the engine number will be prefixed by the year of manufacture followed by G5, or 8 if it’s from an AJS. There are 12 fins on the cylinder, the 250 has only nine, though it seems to be lacking the rockerbox fitted with an exhaust valve lifter of the 350, which was also fitted to some late 250s. The chassis is a 250 as evidenced by the 17in wheels; the 350 had 18in and the squatter front frame loop. The distance between the headstock and front engine mounting lugs is an inch longer on the 350 at 7¾in and the top of the carburettor should be level with the rear sub frame mounting bolt on both models, on the smart test machine it is somewhat higher. As standard the CSR models sported chrome plated mudguards and chainguard, as in the left hand motorcycle in the factory shot in the article. My first motorcycle in 1971 was a 1965 G2 CSR on which I passed my test and I still have it – I was so impressed, I purchased an AJS Model 8 Senator in 1971. Although similar in appearance, they are totally different beasts, the 350, 72mm bore 85.5mm stroke with a 6.9:1 cr is a docile plodder, the over square 250 with 9.5:1 cr thrives on revs and is in fact the faster machine, achieving 84mph in period tests. 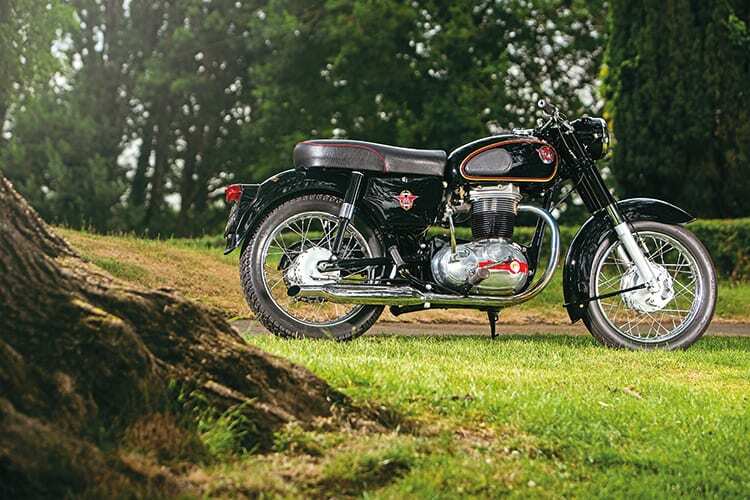 In 1964, in the hands of Peter Williams and Tony Woods, an AJS Sapphire Ninety won the 250cc class of the Thruxton 500 miler production race beating the ‘technically superior’ Japanese machinery! I converted my 350cc AJS into a trials machine in the mid-1970s and it has served me well in competitions and trail riding all over the country, proving to be very reliable and much fun and remains in my custody. Read more News, Features and Letters in the November issue of TCM – on sale now! Andy Pennell’s very pretty Matchless. It seems it is actually of 350cc – thanks to all who wrote in.